House Housing: An Untimely History of Architecture and Real Estate in Nineteen Episodes was the first public presentation of a multi-year research project conducted by the Temple Hoyne Buell Center for the Study of American Architecture at Columbia University. 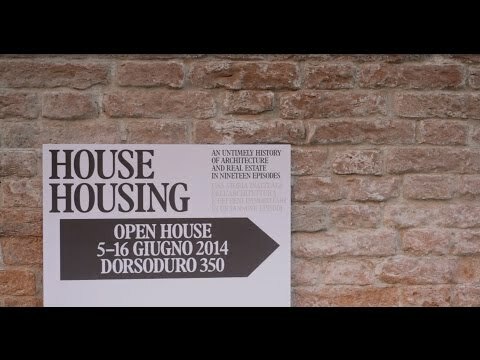 Installed in the third-floor apartment of Columbia’s Casa Muraro in Venice and staged as an open house, the exhibition responded unsolicited to the proposal by Rem Koolhaas, curator of the 14th International Architecture Exhibition, that architecture focus on its “fundamentals.” House Housing replied by considering architecture’s economic fundamentals, which locate housing at the center of the current economic regime, with the United States as an influential node in a transnational network. In architecture, economic fundamentals are built from the ground up. The laws of real estate—relating to the acquisition of land, the financing of construction, the cost of building maintenance and services, profit from rent or resale, the value of equity, or the price of credit—inexorably shape any building component (like a window) and any building type (like a house). They are visible even in the residential work of such singular figures as Frank Lloyd Wright, not least because the Greek oikos, or household, forms the root of the word “economy” itself. But look closely and you will see that what seems fundamental, basic, or natural is, like any other law, a historical artifact permanently under construction and subject to change. House Housing narrated nineteen brief episodes from across the last one hundred years in a mixture of domestic media, from phonograph to television, answering machine to iPad, converting the apartment into a whispering, humming history machine. Though they mainly focused on the continental United States, the discrete episodes are excerpts from global processes. Their artifacts range from houses designed by figures as well-known as Frank O. Gehry to seemingly ordinary gated communities in Florida. Their untimeliness is twofold. First, these episodes return us to financial matters widely discussed in the immediate aftermath of the 2008 foreclosure crisis but now largely abandoned by mainstream discourse. Second, the historical episodes disclose surprising repetitions of themes, tendencies, and actions. This reminds us that the economic infrastructures on which architecture rests are the outcome of such repetitions, rather than an a priori, natural ground. The exhibition and associated programming was made possible thanks to the support of the Avery Architectural and Fine Arts Library, in particular Director Carole Ann Fabian and Drawings and Archives Curator Janet Parks; The Frank Lloyd Wright Foundation; the Art History and Archaeology Department at Columbia University, in particular Chair Holger Klein and Associate Johanna Fassl; and Dean Mark Wigley of Columbia's Graduate School of Architecture, Planning, and Preservation.